Faustina Senior. AD 139 to 141 (life time issue). Silver denarius. Size : 17.5 x 18.7 mm. Weight : 3.15 grams. Obverse : Head of Faustina Senior right, with FAVSTINA AVG ANTONINI AVG P P around (much of the inscription did not strike up properly). 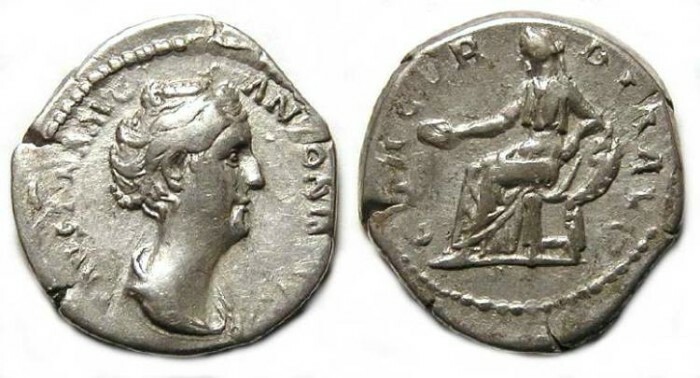 Reverse : Concordia seated left, holding a palladium and sceptre, with CONCORDIA AVG around. The reverse inscription can be read but is poorly struck. Coin of Faustina Sr. struck during here lifetime are much rarer than the later DIVA issues struck in commemoration of her.